Get ready to experience Cebu’s Instagram Capital, sold exclusively on Klook! From the makers of The Dessert Museum Manila and Inflatable Island in Subic, a new water playground is making its way to Cebu City: Happy Beach, the first bohemian carnival-themed inflatable waterpark in the country! Enjoy your stay with your choice of 4 hour or all day to the Inflatable + Unicorn Island! Get your tickets at the best price on the market, exclusively offered on Klook! Are you ready to get wet, wild, and happy in Cebu City? Get your tickets at the best price only on Klook - Happy Beach's exclusive ticketing partner - and have some fun in the sun! From the makers of the largest floating playground in Asia and the most scrumptious museum in Manila is the first ever bohemian carnival-themed inflatable waterpark! Get to see familiar attractions most loved by beach goers at Inflatable Island in Subic such as giant slides, swings, trampolines, human launchers, and many more. 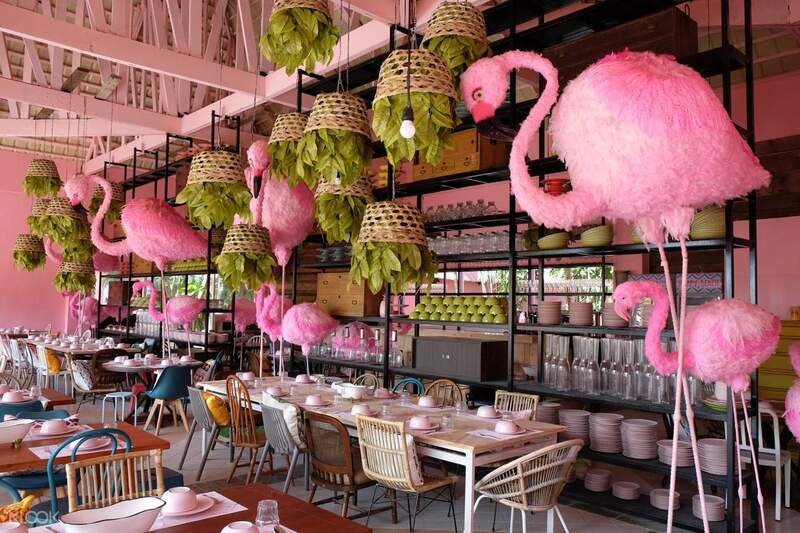 Get access to the the Bali-inspired lounge where you can chill and relax, the Floating Zoo where you can ride and share adorable floaties, the Pink Pool where you can swim and do exciting activities plus 3 other surprise attractions you will definitely love. Don’t forget to strike your best poses in a waterpark tailor made for your Instagram and social media feeds. 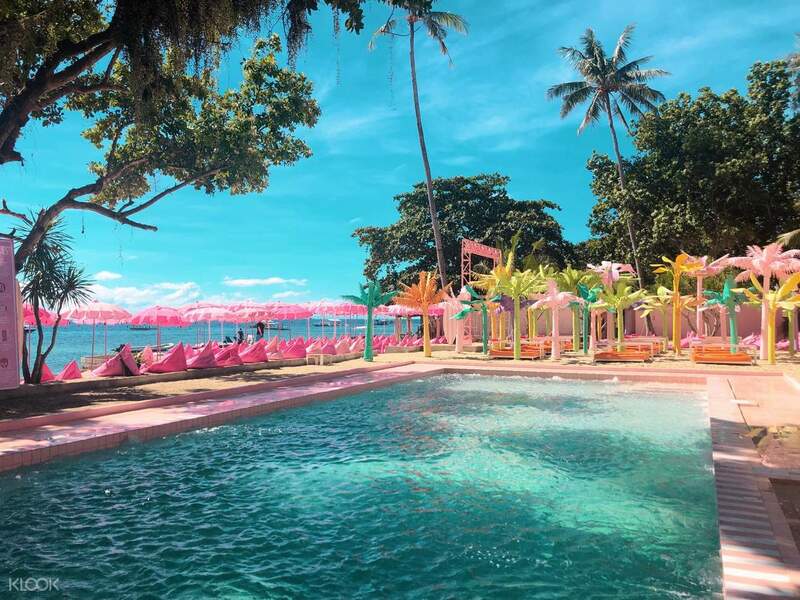 Go frolicking along the beautiful Tambuli Beach with either a 4 hour (Spray) or All Day pass (Soaked) to Inflatable + Unicorn Island and have the absolute time of your life in the giant water playground of Happy Beach where everyone will surely leave with a smile on their faces! Don't miss out on any of the fun activities that Happy Beach has to offer! From the airport, follow Airport Arrival Road and Lapu-Laput Airport Rd. It was a great experience! The amenities though needs some fixing like the aircon at the restaurant, shower with fresh water at the huge bucket-come on we need a decent faucet! But kudos to the concept and design! More amazing is the service... staff seems so well trained and well mannered - very very accommodating! We sure will be back! It was a great experience! The amenities though needs some fixing like the aircon at the restaurant, shower with fresh water at the huge bucket-come on we need a decent faucet! But kudos to the concept and design! More amazing is the service... staff seems so well trained and well mannered - very very accommodating! We sure will be back! Our driver Kuya Roosevelt was professional, patient and on time. He picked us up at 9:40 am, 20 minutes before the scheduled time. We went to Sirao Garden, Tops Lookout, Temple of Leah, Taoist Temple. Quick lunch stopover at Zubuchon. Then we drove all the way from Cebu City to Cordova to visit 10,000 roses (1.5-hour travel time due to traffic). We got back a few minutes before 8pm. The 10-hour car charter was perfectly convenient for a whole day tour in Cebu, you might want to consider this private charter instead of joining a group tour or the DIY route like habal-habal or grab. Highly recommended! Our driver Kuya Roosevelt was professional, patient and on time. He picked us up at 9:40 am, 20 minutes before the scheduled time. We went to Sirao Garden, Tops Lookout, Temple of Leah, Taoist Temple. Quick lunch stopover at Zubuchon. Then we drove all the way from Cebu City to Cordova to visit 10,000 roses (1.5-hour travel time due to traffic). We got back a few minutes before 8pm. The 10-hour car charter was perfectly convenient for a whole day tour in Cebu, you might want to consider this private charter instead of joining a group tour or the DIY route like habal-habal or grab. Highly recommended! We had an amazing day! I think this is the only resort in Cebu where you can almost feel that you are in a cartoon show/movie. It's very instagramable and a very different beach experience. I really appreciate the staff for always greeting us with a happy smile and really did give their best during the happy dance show (I forgot what they call it) Thank u Klook and The Happy Beach Cebu for the unforgettable "Happy Day" experience! Watch my vlog on YouTube. Just search "Carrell Johannes TV" We had an amazing day! I think this is the only resort in Cebu where you can almost feel that you are in a cartoon show/movie. It's very instagramable and a very different beach experience. I really appreciate the staff for always greeting us with a happy smile and really did give their best during the happy dance show (I forgot what they call it) Thank u Klook and The Happy Beach Cebu for the unforgettable "Happy Day" experience! Watch my vlog on YouTube. 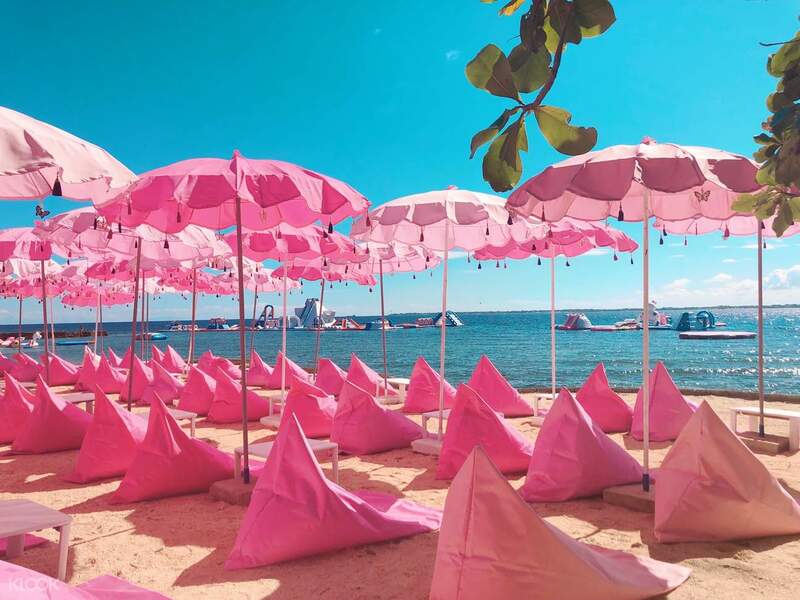 Just search "Carrell Johannes TV"
Prepare your poses and don’t forget your cameras because Happy Beach Cebu features the most Instagram-worthy spaces and corners. 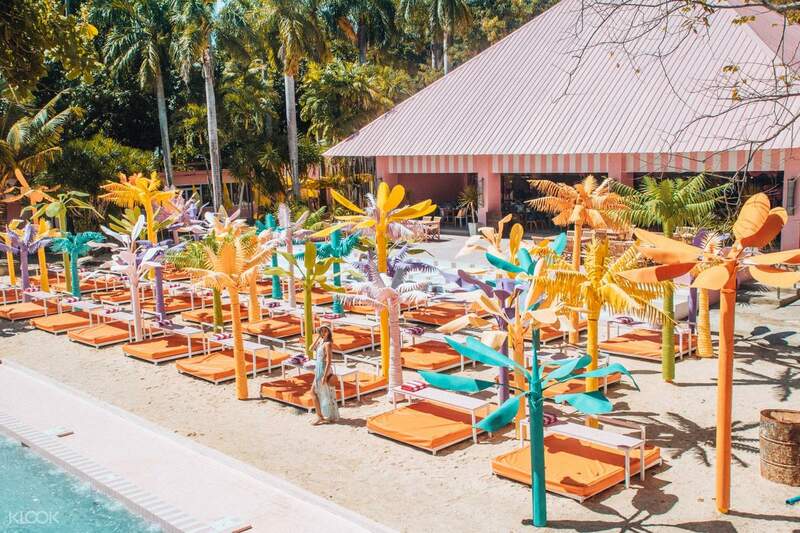 From pastel-colored palm trees to the Bali-inspired pink lounge, pool bar, and rooms—it is truly a content heaven for everyone. 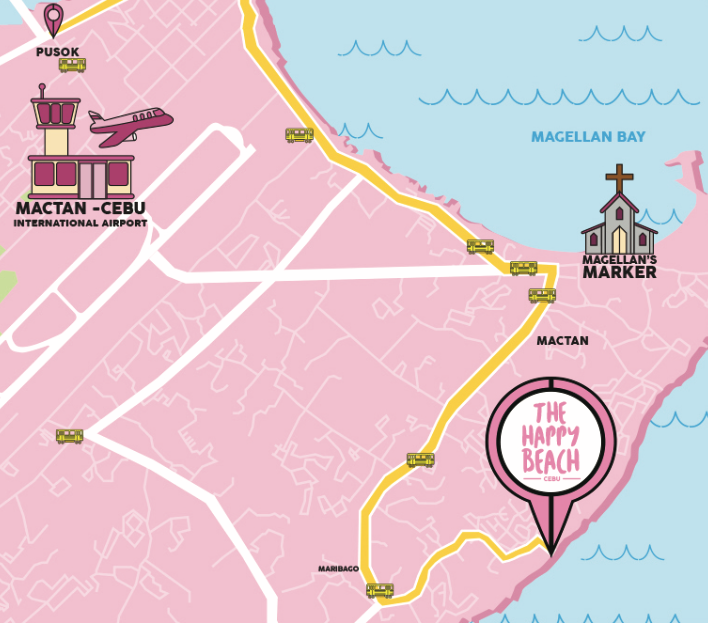 Prepare your poses and don’t forget your cameras because Happy Beach Cebu features the most Instagram-worthy spaces and corners. From pastel-colored palm trees to the Bali-inspired pink lounge, pool bar, and rooms—it is truly a content heaven for everyone. First of all, we booked the All Access package (Soaked Package) thru Klook. Inclusions: 1 Daybed (good for 4 pax) 1 Lunch Set (each pax) 1 Snack Set (as one) 1 Free Towel rentals (each pax) ALL ACCESS (So we pretty much went to all places) Staff: Very hospitable people and you can see why the place is the happiest, kudos to your HR 👍 Place: Of course! We snapped our record breaking 300 plus photos within 2 hours. It was wonderfully designed and very colorful. Inflatable Island: Challenging and fun! It looks easy on pictures but the difficulty got me beat. Lowside, accessible only via boat as of the moment. So ask them first if it is still the case in your planned visit date before bringing elderlies or babies/kids with you. Cost? Sure our opinions vary so much when talking about budget. You need to buy food from their bar or restaurant so a tip from me is get the package with food inclusion to avoid extra purchases on your stay. Another is to bring in more friends to chip in. Also, book ONLINE for special offers. Overall: Very satisfying! Highly recommended! Balik mi kung mang invite amo friends weee! First of all, we booked the All Access package (Soaked Package) thru Klook. Inclusions: 1 Daybed (good for 4 pax) 1 Lunch Set (each pax) 1 Snack Set (as one) 1 Free Towel rentals (each pax) ALL ACCESS (So we pretty much went to all places) Staff: Very hospitable people and you can see why the place is the happiest, kudos to your HR 👍 Place: Of course! We snapped our record breaking 300 plus photos within 2 hours. It was wonderfully designed and very colorful. Inflatable Island: Challenging and fun! It looks easy on pictures but the difficulty got me beat. Lowside, accessible only via boat as of the moment. So ask them first if it is still the case in your planned visit date before bringing elderlies or babies/kids with you. Cost? Sure our opinions vary so much when talking about budget. You need to buy food from their bar or restaurant so a tip from me is get the package with food inclusion to avoid extra purchases on your stay. Another is to bring in more friends to chip in. Also, book ONLINE for special offers. Overall: Very satisfying! Highly recommended! Balik mi kung mang invite amo friends weee! We arrived early and was able to fully enjoy the place (since there were still fewer people).I like how colorful everything is.definitely perfect for pictures. We arrived early and was able to fully enjoy the place (since there were still fewer people).I like how colorful everything is.definitely perfect for pictures. It’s great to purchase the package with the daybed and snacks. We have enjoyed ourselves a lot on the inflatable like going through ninja warriors. The staff are generally very friendly and helpful. All is great except for the toilet and showering facilities. The doors are not working, quite dirty and the water flow of the showering facilities is pathetic in the evening. It’s great to purchase the package with the daybed and snacks. We have enjoyed ourselves a lot on the inflatable like going through ninja warriors. The staff are generally very friendly and helpful. All is great except for the toilet and showering facilities. The doors are not working, quite dirty and the water flow of the showering facilities is pathetic in the evening.